**No refunds for cancellations after 4pm on March 20. On April 6, 2018, the unimaginable happened when the Humboldt Bronco's bus collided with a semi-truck at a quiet remote intersection in northeast Saskatchewan. Sixteen of the 29 people on the bus were killed -- the remaining 13 were left with lasting physical and emotional scars. The team's volunteer directors were quickly overwhelmed and at wits end trying to support the families, manage the crisis and respond to questions -- all while themselves grieving the loss of so many from their closely knit team. No crisis plan existed; website and social media passwords were known only to people who were lost in the crash; families, fans, the community and the hockey world were demanding answers; hundreds of reporters were calling frantically with questions. The world was watching. 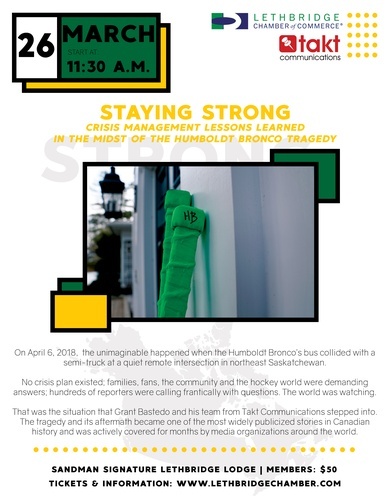 That was the situation that Grant Bastedo and his team from Takt Communications stepped into when they began, what would become, a six-month engagement working with the Humboldt Broncos. The tragedy and its aftermath became one of the most widely publicized stories in Canadian history and was actively covered for months by media organizations around the world. After 28 years working in public relations and communications, Grant is no stranger to crisis management. However, nothing had prepared him for the magnitude and scope of this tragedy -- every other crisis paled in comparison. In the midst of the stress and chaos many valuable lessons were learned. Grant has prepared a presentation that shares those insights, so others may be prepared if they unfortunately experience a crisis situation. Grant, an accredited member of the Canadian Public Relations Society, is donating his time to travel across Canada in 2019, sharing the lessons he and his team learned, and the importance of proper crisis preparedness. His presentation "Staying Strong: Crisis management lessons learned in the midst of the Humboldt Bronco tragedy" will give you a behind the scenes look of what it's like to deal with a major crisis and how Takt's small team overcame seemingly insurmountable issues under intense time pressures.